A few weeks ago, my good friend, a fellow gardener and mom of a toddler called to ask me about seed storage. Turns out her toddler had “helped organize” and she was in need of a new solution. 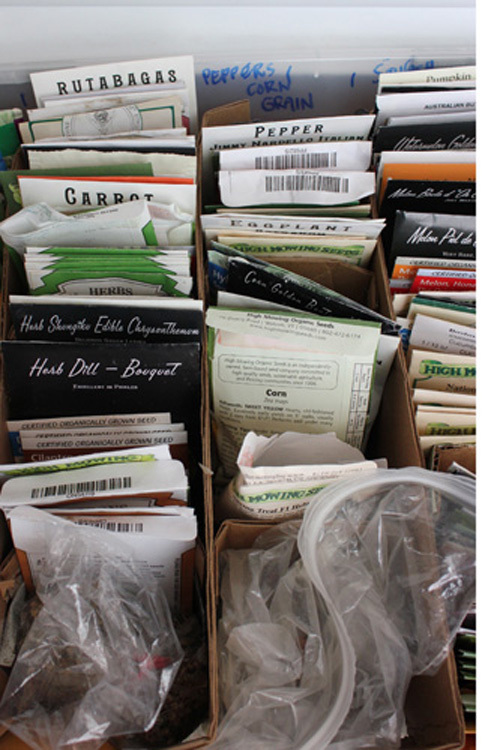 We have used the same simple seed storage and organization system for years, and it really works well for us. 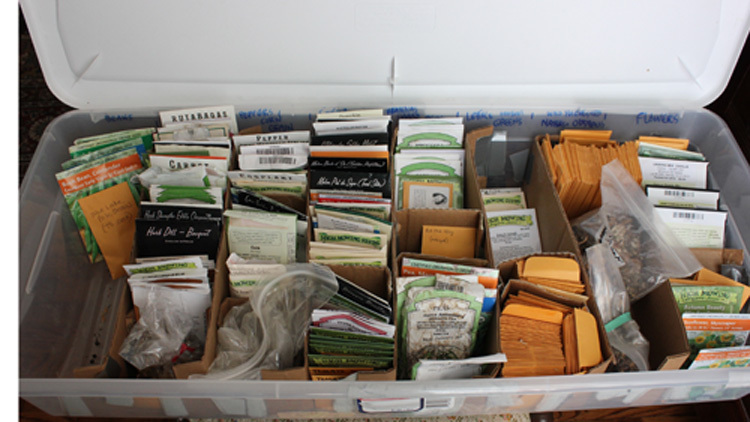 Since I have a bit of a seed buying addiction, having a neat, well-organized way of storing seeds is really important; I don’t want to waste time sifting through stacks of packets! Some things to consider when you’re storing seeds from year to year are 1) keeping the seeds cool, and 2) keeping them dry. Seed germination rates will decrease over time, but paying attention to these two factors really helps. If you’re wanting to test your germination rates, I suggest this method. Some people recommend storing seeds in a refrigerator, but who has that kind of space? I would suggest a cool pantry or another space where temperatures will not fluctuate dramatically. but I have not found this subdivision necessary. When it’s time for me to sow seeds, I quickly grab the seeds I need, pull them into a small basket, and keep that basket with me while I start seeds. The time I save having my seeds organized and stored neatly becomes more time that I can spend playing in the garden! How do you store your gardening seeds? I store mine in jars in the fridge, to make them last longer. I love this box idea; just wish it would fit in the fridge or freezer! It’s the only down side! But I have way too many seeds to put in the fridge! On a totally unrelated note, I found your singing audition tips online, and they were incredibly helpful! Thanks! Reblogged this on Oldschool Prepping/Homesteading/Self Reliance. What a great idea. How many years can you successfully keep seeds until you think it is best to just trash them? we did ours just like this too.. Infact I had to look at the pic twice!!! lol.. it has worked for years and the only change we made was a locking lid, ( I drop things more than the kids..) I like that It is very portable. I can grab it in a bug out.. My seed are currency to me! Love the blog! It is super portable and easy, I’m not at all surprised that others have the same storage plan!